Games played at DC Ranch (Copper Ridge School). Take Loop 101 North(in Scottsdale), go past Bell Road. Take Pima Road exit (note this is the SECOND Pima Rd exit......the other one is 6 miles further south below Shea Blvd and you don't want this southern one), get in right exit lane and bear right at exit ramp light, and continue north on Pima Road. Go 2 miles. Turn right (east) at East Thompson Peak Parkway (Note...be in the right hand lane way before this stop light, as there is a turn lane for this exit that bears off to the right before you even get to the stop light). Go straight east 1.75 miles to the Copper Ridge school. Take a right at the school entrance and then bear right. Field is behind the school on right. Directions: I-10 South to Tucson exit at "Downtown" exit, (also known as Broadway/Congress exit) Go left (east) under I-10 on Broadway, 6.5 miles to Craycroft Rd. Then right (south) on Craycroft for 2 miles to the park (on your right) just before Golf Links Road. The field is around to the back of the complex. From Hayden Rd in Scottsdale (either 1/2 mile south of Shea or 1/2 mile north of Via Linda/Doubletree Ranch Road), go east on Mountain View Road. The field is on the corner of Mountain View and 84th Street on the North side of the school. There is a small parking lot off of 84th St. in front of the field or you can park at MtnViewPark to the east and walk from that direction. turn right onto Bell and follow down to 98th St. Turn right on to 98th and follow road to school. Going S(E) on the 101, take Princess Dr. exit, stay on frontage road heading south, turn left on Bell Rd. Turn right on 98th and follow road to school. Comments: Play is on the football field. Directions: From the AZ-51 take the BELL RD. exit (EXIT 13). Go East on BELL RD. 1/4 mile, turn NORTH (left) on 40th ST.
Go about 300 yards and the parking lot is on the West side of 40th St. The football field is west of the parking lot behind the Gym. Directions: Football Stadium is on 15th Ave - North of Thomas Rd. Park in the student parking lot just South of the Stadium. There might be a few spots available NORTH of the stadium. MAPQUEST is correct, other mapping sites are still WRONG. Just follow the directions here......Go North on Tatum Blvd (appx 48th St), 1/2 mile north of Loop 101, to Deer Valley Rd. Go west (left) 1.5 miles and road takes you right into Pinnacle HS. Field is just northwest of the football stadium. 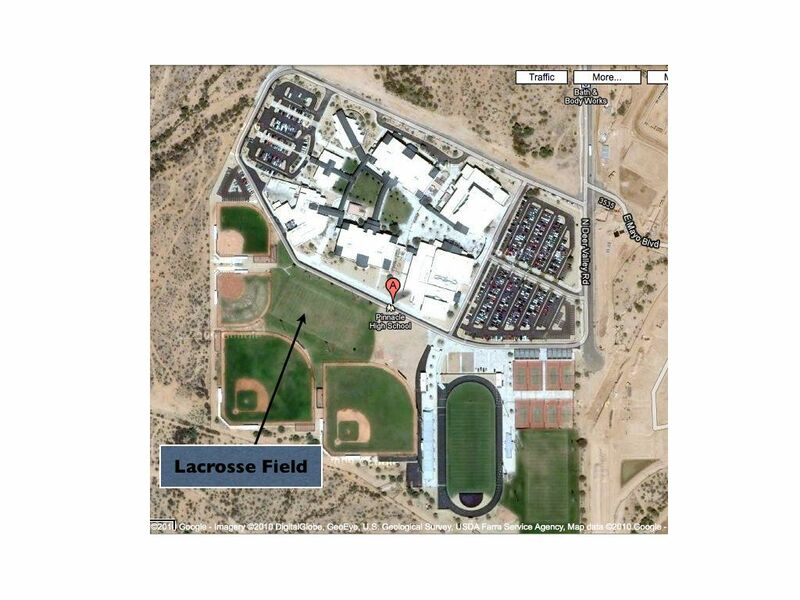 This school is in FAR NORTH Phoenix by the standards of most of our teams, so give yourself ample driving time! Directions: 202 East to Power, South on Power to Brown, East on Brown about a quarter mile and school is on the right. From the 60 take the Power exit and go North to Brown, East on Brown about a quarter mile and school is on the right. Field is at the back of the school next to the tennis courts and baseball fields (not the stadium). 1/2 mile north of Thunderbird Rd. & 2 blks east of Tatum Blvd.